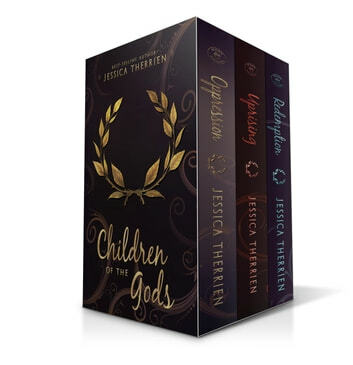 Jessica Therrien follows up her bestselling novel OPPRESSION with UPRISING & REDEMPTION, completing her Children of the Gods series. OPPRESSION, translated and sold around the world, was one of the best selling YA novels of 2016. Available together for the first time, this special ebook bundle includes OPPRESSION, UPRISING, & REDEMPTION, as well as a bonus chapter from William's perspective. Elyse knows what it means to keep a secret. She's been keeping secrets her whole life. Two, actually. First, that she ages five times slower than average people, so that while she looks eighteen years old, she's well over eighty. Second, that her blood has a mysterious power to heal. For Elyse, these things don't make her special. They make life dangerous. After the death of her parents, she's been careful to keep her secret as closely guarded as possible. Now, only one other person in the world knows about her age and ability. Or so she thinks. Elyse is not the only one keeping secrets. There are others like her all over the world, descendants of the very people the Greeks considered gods. She is one of them, and they have been waiting for her for a long time. Some are waiting for her to put an end to centuries of traditions that have oppressed their people under the guise of safeguarding them. Others are determined to keep her from doing just that. But for Elyse, the game is just beginning-and she's not entirely willing to play by their rules. Terrible, terrible writing, the worst I've read in a long while. 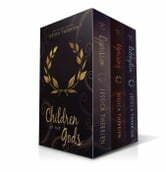 Great series for any age. This may be a YA series, but it is very well written and will keeping you guessing until the very end.